Maersk welcomes the latest next-generation Triple-E vessel – the most modern in the fleet – which has made her maiden voyage to Rotterdam. Maersk’s commitment to Dutch customers continues, with product portfolio including both ocean and logics and services and two terminals serving as a major gateway to the country. In 2017, Maersk launched its second generation of Triple-E vessels, known for improved energy efficiency and environmental performance. On 21 February, the latest vessel, Maastricht Maersk, arrived for the first time to Rotterdam on her westbound voyage from Asia. The vessels in this class all bear names stating with “M” and are called after cities in countries where Maersk has strong presence and a significant share of business. The company offers a wide range of direct connections from The Netherlands to all parts of the world via the Port of Rotterdam, where Maersk subsidiary APM Terminals operates two container terminals, including APM Terminals Rotterdam and the automated facility Maasvlakte II, opened in 2015. As of January 2019, Maersk offers ocean products, as well as logistics and services, under a single brand, offering Dutch customers a wide range of end-to-end supply chain solutions. One of the company’s strongholds in The Netherlands has traditionally been intermodal, with a broad portfolio of products including dedicated rail connections, barges and trucking. 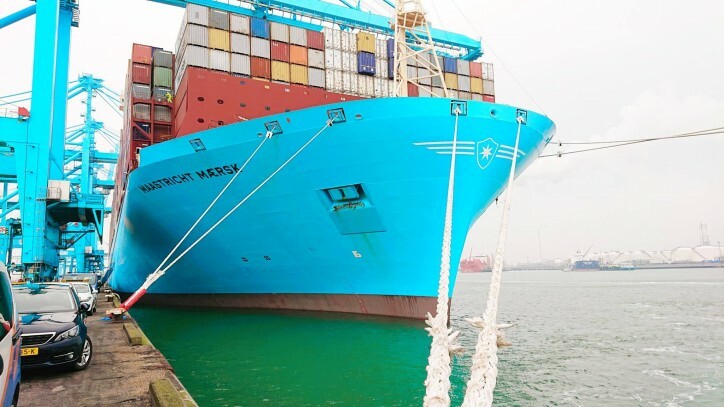 Maersk is also expanding its non-physical products offer in The Netherlands, notably with Trade Finance or Customs House Brokerage. “On this symbolic occasion of Maastricht Maersk’s arrival, we thank our customers for their support and trust and we look forward to unlocking many new business opportunities in the future.